Recorded as Bond, Bonde, Bonds, Bondar, Bounder, Bonder, Bundy, Bunday, and others, this famous and interesting surname is recorded in most European countries, but is considered to be of Anglo-Scandanavian pre 7th century origins. It was at first a status surname for a peasant farmer or husbandman, the derivation being from either the Old Norse-Viking word "bonde", or the Olde English and Anglo-Saxon word "buan", both meaning to dwell, but an alternative is from "bindan", meaning to bind. However spelt the original object was to describe a yeoman holding lands which were 'bound by loyalty' to the local lord, although only after the Norman Conquest of England in 1066 did the word become associated with the idea of servitude for life. The surname is first recorded in the latter half of the 12th Century (see below), whilst other early examples include William Bonde of Warwickshire noted in the Records of the Knights Templar of England in 1185. 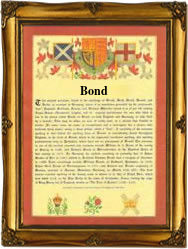 Later examples of the surname recording include the marriage of Elianor Bond and Richard Laplove on November 12th 1576 at the church of St. Gregorys by St. Pauls in the city of London, and that of John Bonder, who married Elizabeth Webb at Knightsbridge, Westminster, on June 4th 1650. Thomas Bond was an early settler in the New World, being recorded as living in Boston, Massachusetts in 1679. The first recorded spelling of the family name is shown to be that of Norman le Bonde, which was dated 1180, in the "Pipe Rolls of Warwickshire", during the reign of King Henry 11, known as "The Builder of Churches", 1154 - 1189. Throughout the centuries, surnames in every country have continued to "develop" often leading to astonishing variants of the original spelling.